During my recent weekend trip toWilliamsburg with my family, we rented a Colonial house right off the main street through town. The house sat behind the Brick House Tavern, which is now a hotel with 16 rooms. This little house apparently used to be a shop for the tavern, but has now been renovated beautifully. It's so cute. I thought I would give you a little tour, in case you were ever looking for a unique place to stay in Virginia. 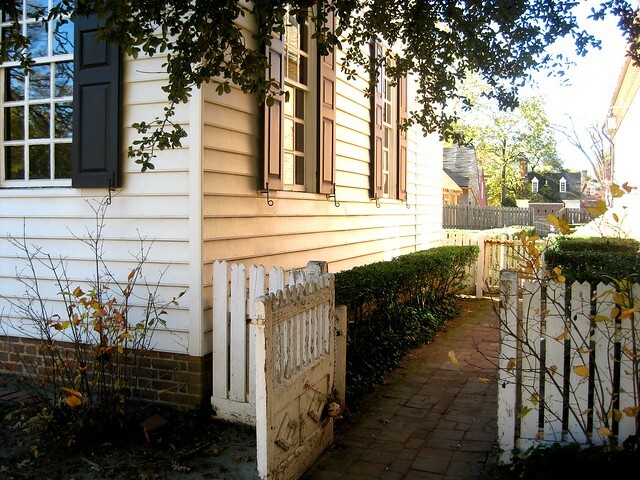 There are 20 something restored Colonial houses you can rent all throughout Williamsburg. You rent them through the fancy-shmancy Williamsburg Inn, so you get the benefits of being a guest at the Inn. Score. Just resist the urge to trip someone when you walk through the Inn. The people are so pretentious I wanted to die. You walk in to the sitting room on the first floor. 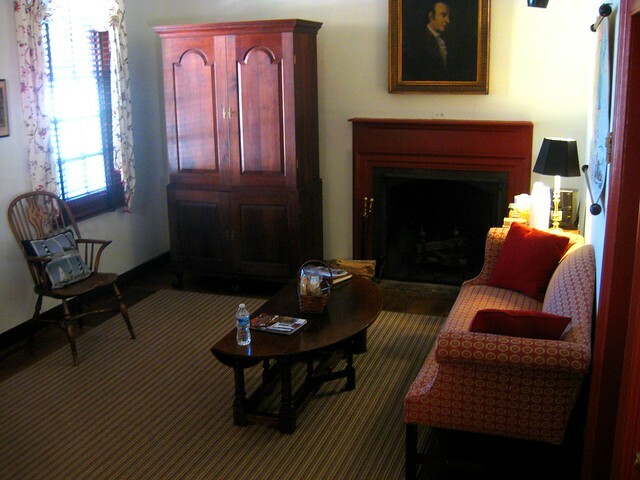 There is a beautiful fire place, sofa, two arm chairs and a huge armoire with a TV that we never turned on. Please ignore the super creepy picture above the fireplace. Don't talk about it. I can't. While you are ignoring the picture, notice the pattern on the sofa. Love! 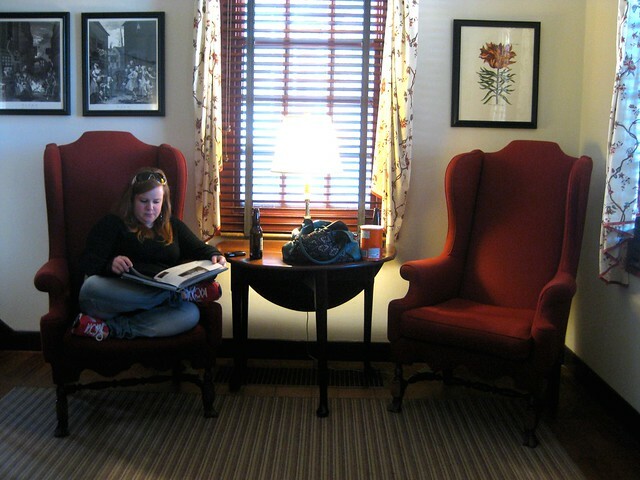 Devon and I spent a lot of time relaxing, reading and enjoying the fire in those chairs. I really liked the curtains and the the thick wood blinds. There is a bedroom with a King size bed on the first floor, with it's own bathroom. I forgot to get pictures of that room of course. But the bed has a beautiful canopy, similar to the pattern on the curtains. 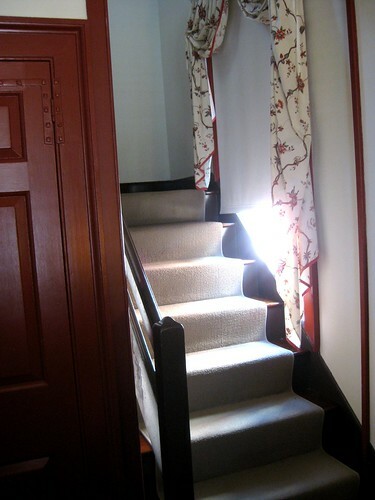 Go up the stairs to get to the second bedroom, where Devon and I stayed. 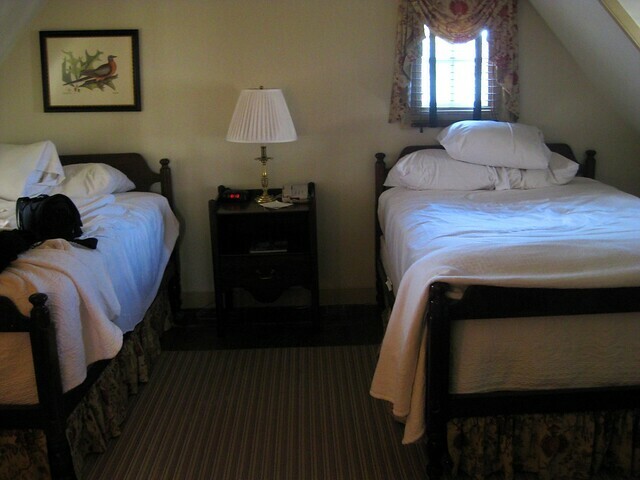 The bedroom upstairs has 2 double beds. We felt like we were in Heaven. We stayed at this house years ago, and remember there only being twin beds. Thank you, Williamsburg, for providing me the space to sleep diagonally. 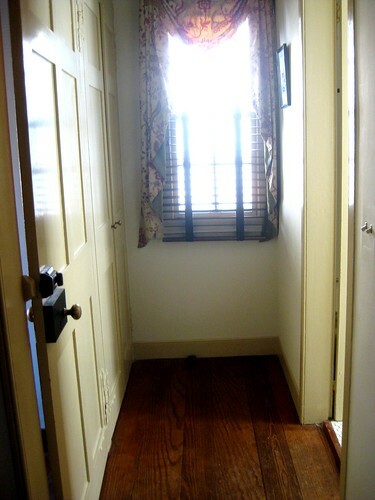 This is the door from the stairs, and the bathroom across the hall. I love the door handle and the dark wood floors. 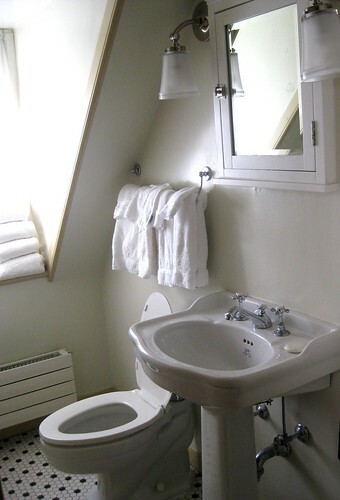 This was our bathroom, so bright and white. The shower was incredible too - one of those shower heads in the ceiling that rains water down on you. Devon and I both took showers that left our hands wrinkly, just to stand under the falling wall of water for 30 minutes. Back downstairs to the side of the house, which leads to a garden. I looked out my window one morning and saw 2 men dressed in full Colonial attire building a little house down the street with hammer and nails. They really get into character around there. 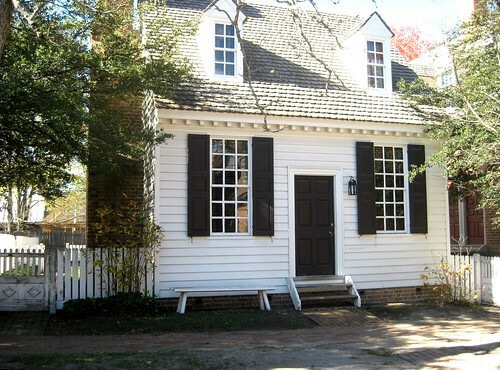 If you are ever traveling through Williamsburg, Virginia - I recommend trying out one of the houses they have there. It's a fun, authentic way to enjoy the history that just oozes out of that place. What an adorable house! You never see stuff like that in Texas - that's for sure! Glad you're having a fun trip. That house is gorgeous! Looks like you're having a great time - can't wait to hear more! Love that little house. Of all the houses we've stayed in over the years, thats my favorite! Your pictures are great. I've never actually been to VA and so it was a lot of fun to read this post. That house you stayed in looks so very quaint! My family has stayed in this little house a couple of times. I think its the best place to stay in Williamsburg. As you noted, its unpretentious but most of all, it gives you the feel of living there. I love waking up early to hear the slave William Wales singing as he walks by and its a rush to wander out at night when all of the tourists are gone and go have a drink at Chownings. Thank you for the wonderful pictures. My family and I have also stayed at this house. We just love it. It is close to everything. Also love the colonial cat named Eleanor who lives at the Brick House Tavern. Thank you for the detailed photos -- it is so hard to find any photographs of the house online. We just booked a stay there in a few months. Can't wait! I live in Williamsburg and love these colonial houses. It's great to be so close to so much history and Colonial Williamsburg really makes it come alive!